Maneki Neko, the Tale of the Beckoning Cat is the story behind the little cat statues we see on the counter at our favorite Asian cuisine restaurant. The little cat is depicted with one raised paw, the "beckoning cat." She is said to bring luck by "calling good fortune to each of her owners with a wave of her paw." My boys learn so much through discovery, and wondering the significance of this beckoning cat led us to reading this book and learning more about this custom. The story follows Tama, the cat who lives with a poor monk and ends up bringing him good fortune, which he passes on to his neighbors. It is a story of kindness, sharing, and friendship with a sweet message, as well as a peek into Japanese culture. This charming story is beautifully illustrated with serene blues and purples, complete with scenes of Japan, such as the blossoming cherry trees, the countryside, and Mt. Fuji in the background. The illustrations are reminiscent of other Japanese artwork that we have studied. A vocabulary list includes unfamiliar words like Sensei, Shoji, and Tatami. 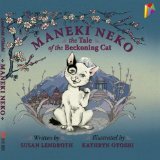 My boys and I all enjoyed learning more about Japanese culture through Maneki Neko, the Tale of the Beckoning Cat, and this eBook format was easily accessible, inexpensive, and beautiful to look at.